(CNN) -- A small military plane on a training flight in heavy fog crashed Thursday into a populated area of Quito, the capital city of Ecuador, killing the five people aboard and two on the ground, authorities said. Residents are helped to leave a building in flames, after the plane crash set it on fire. The Beechcraft was carrying three members of the military and the wife and son of one of them, said Ecuador's Minister of Defense, Javier Ponce. Asked why relatives would be traveling on a training flight, Ponce told CNN en Español, "This is under investigation." He said two people in a building were killed. Earlier, authorities had said that three people on the ground were killed and three in the plane were killed. 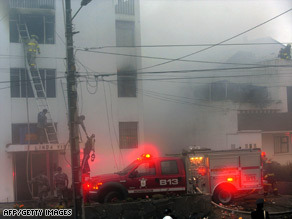 Television footage from Ecuavisa showed at least one building in flames in the neighborhood of Guapulo in northern Quito. The crash occurred at 5:30 p.m. (10:30 p.m. GMT). "I heard a loud, loud noise," said a man who was on his patio when the plane flew overhead. "I looked up and saw a small plane, super low, and then I heard a boom and went downstairs to see what happened." He ran outside to see a four- or five-story building 100 yards away, its top two floors "completely on fire." He said he entered the building to see if anyone needed help, but was turned back before he got to the second floor. "It was just too hot," he said. He said once he was back outside on the street, it became clear to him that the chances anyone aboard the plane had survived were slim. "We were stepping on, like, wreckage," he said. Journalist Rodolfo Munoz contributed to this story from Quito.